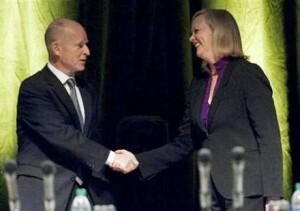 In a well-argued and classic ideological debate for governor, Republican Meg Whitman Tuesday night aggressively attacked Democrat Jerry Brown as a tool of public employee unions who will do nothing to change the status quo in Sacramento while he repeatedly portrayed her as an ill-prepared Schwarzenegger clone with policies designed to serve only the rich. “I don’t think you can find two more different candidates,” Whitman told reporters moments after the event at UC Davis ended, summing up the sharp contrasts between her and Brown on major issues, especially tax policy, illegal immigration and their ability to work effectively as governor to balance competing interests. Although the candidates for governor were closely matched, Whitman kept Brown on defense throughout much of the one-hour event at UC Davis, repeating the attack lines from her commercials. Brown, however, was more natural, funny and unrehearsed, as he reached to make a more personal connection with voters who might be just tuning into the race. “I care a great deal about public service,” Brown said in his best riff. “I think it’s honorable. And I’ve lived in this state all my life. I love it and I voted here all my life. God willing, I’ll spend the rest of my life and die in this state. I love it. Polished, if somewhat nervous, eMeg was consistently on message and solid in discussing policy as she kept up a steady stream of sharp criticism against Brown’s record on taxes and spending during his first turn as governor, and his performance on schools and crime while mayor of Oakland. Time and again she hit him over the strong financial backing he has from labor, playing on public anger against government and pessimism about the direction the state is headed. Besides taxes, the clearest difference between the two came on illegal immigration, with Brown saying he would support a “path to citizenship” for the millions of undocumented workers in California and Whitman saying she would oppose it. Bottom line: an exciting and entertaining event that will not change the dynamic of the race. 4:15 pm The Calbuzz National Affairs Desk is spread coast-to-coast tonight, watching the Dustup in Davis from the Mondavi Center’s Jackson Hall on the UC Davis campus and from a secret livestream location on the Jersey Shore (where, in a separate campaign, the lines are crackling as voters demand The Situation not get dumped from “Dancing With the Stars”). Before our vast team of reporters, editors, photographers and IT support settled in for the evening, however, we dropped by the Paul and Lydia Kalmanovitz Appellate Court to hear some friends and eggheads explain to us what to look for in tonight’s event. Of course, we thought we had a pretty good handle on that when we told you what to look for this morning, but with FPPC Chairman Dan Schnur, SF Chronicle political whirligig Carla Marinucci and three chrome domes from the UCD faculty to inform us, we couldn’t resist. Here’s what we learned: debates can matter, gotcha moments can be important, how a candidate carries him or herself can affect impressions, voters are angry, the people who will be most affected by the debate aren’t watching — they’ll hear about it on TV, radio, newspapers and the internets. More importantly, it looks like the food at the Mondavi Center is not going to be as good as it was at St. Mary’s, where Barbara Boxer and Carly Fiorina went at it a few weeks ago. Cookies, jelly beans, bite-sized candy bars, coffee and water. Pretty basic. But hey, as UC Davis’s Claudia Morain explained: “We’re a public university, not a private school.” Point taken. 4:30 pm The press center is now filling up with ink-stained wretches and wretchettes from all the major MSMs and minor ones too, while Whitman’s Sarah Pompei and Brown’s Sterling Clifford schmooze reporters. This just in — Mitchel Benson, the Assistant Vice Chancellor for University Communications and Baking at UC Davis just dropped off a plate of lemon bars, thereby pushing the food measure beyond St. Mary’s. Also, now, soft drinks! Way to go Mitch. 6 pm : It’s on: Nice quick cuts dramatic open from KCRA. Jerry entered wearing dark suit, Meg in dark suit with fuschia top underneath, they meet in the middle of the stage and shake hands, like it’s some kind of duel, which actually it is. Question 1 from SacBee Amy Chance: Is Sacto ungovernable? Amy sez: Yeah, but what about my question? Meg says the only way he’ll bring people together is by bringing special interests and unions? into the same room. Says unions will be there to collect IOUs. Jerry counter-punches by noting Meg’s tax cut would benefit “millionaires and billionaires like Ms. Whitman.” Says she’d take from education to line the pockets of the rich. Q2: Death penalty cases take too long? Jerry reprises his personal opposition but says he will continue to do everything to implement the law. Meg : I will be a tough on crime governor no doubt about it.? Says this is a big contrast between her and Brown who, she says, has not been tough on crime for 40 years. Brings up Rose Bird – does anyone remember who she is? Starts talking about something called the Criminal Justice League getting stiffed by Brown. Is Superman a member of that? Brown slightly defensive on response. Strange answer on appointing judges by comparing himself to Dwight Eisenhower. Q3 from Marianne Russ on job creation. Meg repeats shtick on cutting business taxes, cutting red tape. Says other states are poaching all our jobs and that she was with Texas Governor Rick Perry who told her he comes on “hunting trips” to California looking for businesses. Brown: Meg’s plan is taken from “the George Bush playbook.” He won’t give a $5 billion tax break to myself himself, much less to the “millionaires and the billionaires.”? He wants to create green jobs and clean energy, and oppose Prop 23 – cutaway shows grinning and looking a little like a bobblehead. Meg has good eye contact with the camera though. Amy Chance asks about pensions and why Jerry would reform the system if he’s benefiting from it? me. How about you Meg – how can you negotiate if you know nothing about government? Says she doesn’t matter because she owns nothing to unions. Doesn’t answer the question of how she could deal with the unions in favor of usual talking points. Says he has “a spine of steel” and will go to the ballot for pension reform. Very energetic Brown says Meg is pot calling kettle black. How can she complain about union contributions when she has spent so much and has huge contributions from fat cats who will benefit from her proposal to cut capital gains? Meg asked about lousy voting record. Briefly repeats by rote her apology and says “If I could change history I would” then immediately moves back to talking points about getting California moving again and creating jobs. Q pivot to Jerry: You ran for president constantly when governor last time – what’s going to stop you this time? Rubs his head and says, “Don’t worry about that” running for president. Meg rebuttal: Jerry Brown has had “no success improving Sacramento for the better.” Rips Brown record both in Sacramento and Oakland. Q: Will you roll back spending cuts for higher ed systems? Brown can’t promise to do it with a $19 billion deficit and can’t even promise to freeze even though he loves UC. How about you Meg ? “We’ve got to put Californians back to work” she says for at least for the fourth or fifth time. She’s going to take “managerial expertise” to Sacramento. Yeah swell says Marianne but what about my question about holding the line on fee increases? I’d leave it to the chancellors. Good question by Amy: How can voters trust you when you distort the truth in your ads? Meg: I don’t accept the premise of your question. Defends the Clinton/CNN ad and says she “stands by it”. (Someone checking into campaign first time has no idea what she’s talking about). Good close about need to change status quo. Amy asks Jerry if he’s proud of his Pinocchio ad? He says it’s “a helluva ad” and that “Pinocchio is standing by” to make Meg’s nose grow for the stuff she’s saying tonight. Follow-up – Meg what do you think about Jerry saying he likes his ad? She goes right back to Clinton ad and says Brown opposed Prop. 13. Very good answer about lack of accountability and tut-tuts Brown for letting down parents and kids in Oakland after promising to be “education mayor”. Jerry jumps in, says yes he did oppose Prop. 13 but Howard Jarvis voted for him and said that Brown made it work. Strong answer. Brown supports a “path to citizenship” and “secure the borders.” As AG says he works with ICE on fingerprint program to make sure to deport illegals who break the law. Workplace inspections part of the solution? Yes, but feds have to do it. “I’m been very balanced and very fair about this” said she would have opposed Prop. 187, (had she lived here and, perhaps, if she would have voted in any case). Opposes Arizona law. “Illegal immigration is just that, illegal and we have to stop the magnet” – somewhere out there Steve Poizner is hocking up choking on his beer. Big difference on path to citizenship. Q: Aren’t you trying to buy the election? Says she has to spend this much because unions spent a total of $300 billion over five years. This will give me independence. If you want someone who will just go along, then I’m not your candidate. Casting Jerry as status quo. Changes in campaign finance laws? “Not the first thing I would tackle.” Ha! Brown: “The Chamber of the Commerce has a secret slush fund that they use to attack me.” Calls on Meg to make them disclose. Meg looks disapproving with a major smirk. Meg: “Putting Jerry Brown in charge of (state government) “is like putting Count Dracula in charge of the blood bank.” Good line that Murphy surely told her she had to get in. Now she’s going to convene a statewide grand jury. “I’ve got, at my age, the independence” to do the job. Amy on water: Will you support Peripheral Canal? Brown: I’ll support whatever works. Notes he sponsored last PC plan. His basic idea is that if you use the water, you have to pay for it. Meg: “Turning our backs on water is turning our backs on jobs.” Sound bites: cheaper by the dozen. She was for Arnold’s water bond plan that got bumped from the ballot. We have a humanitarian crisis in the Central Valley. She believes in the power of money many. Brown thought long and hard about running. It’s a hard job, it’s not for someone who comes from private sector and has just run a business – it’s harder and more complicated and you don’t have all the power. “My values are different in important ways” – repeats his refusal to support tax cut for millionaires, billionaires. Final word gets to Prop. 23 – should not suspend AB 32. Meg looks nervous. A lot of umming…trying to remember her canned lines, I guess. As far as intelligence and planned solutions, Meg is the winner! Jerry Brown is such a bad pol that, as AG, he supported sending a former attorney to four years in state prison for writing a book about the law on his claim any speech about the law is a crime! He is not smart or intelligent and is just a worn out pol who has no solutions for California and is just a windbag who moves with the wind of his own popularity. Every California university and law school has been notified of his support for sending authors of books to prison for four years. Why did Riggs ask Brown if he would run for President? That question should have been directed at Meg… she’s a lot more likely to run than Jerry would be. Elliott is right. But Jerry’s answer was great! Ouch – eliminate sanctuary cities: worst is San Francisco. Aren’t there a lot of voters in that city? She hates Fresno too. Meg is going to pay for workplace inspections out of her own handbag, eh? That’s the first truthful thing she’s said tonight. Love it! Very right Donald. She drives me just crazytown. “The Brown Town” as we call him around here was stronger than the “Meg & Mog” (our brit friends call her that) tonight. She just seems so hopeful on the money she’s blown to run this thing. She’s really reaching. Of course, she’s got a few more weeks to blow away a few more cities like SF as she did tonight. KABlamO! There goes the neighborhood (or at least any voters in the Mission District). Keep it up calbuzz peeps. Thanks for the report! I hope they’re that smart…I’m not so sure. i agree on the hope…however i am personally more optimistic about the smarts and abilities in the mission than I am about the smarts and abilities in the sactown politicians fixing the legacy system there, no matter who gets elected. Who remembers Rose Bird? Pete Wilson and not many others whose votes count in this election. The Dracula quote was pure Murphy but off-putting and just in time for Halloween. Clearly, there were better ways, less disgusting ways, to make her point. Let’s see how many ‘journalists’ pick it up. Meg lost this one and her advisors should be docked their pay. I’m not seeing any high fives coming out of that campaign tonight. For Meg, the important thing will be to identify who has the courage to tell her the truth vs. the advisor who cashes his next check ASAP. First of all I have to say that the questioners did a good job. In fact, the whole debate was handled very professionally by the candidates and the people running it. Secondly, Jerry Brown came across as genuine and committed. He’s willing to devote the rest of his life in public service to CA. eMeg’s presentation sounded corporate, memorized and awkward. Sure, Jerry showed his unpredictable side and he said “hell” a few times but WTH! Whitman would just be another Schwarzenegger but without a conscience. A little disappointed they didn’t go any deeper into Prop 23. Schwarzenegger made an extremely strong speech today on the topic and attacked the billionaire, Tea Party, “black oil” tycoon Koch brothers, Valero and others for trying to destroy one of the best decisions the CA voters have made during his administration. The Dracula quote from the man who brought us Count Taxula. I bet Schwarzenegger still has nightmares about THAT press event. Shudder. And why did eMeg keep mentioning the definition of insanity? I don’t believe that’s really an Einstein quote anyway. A lot of people attribute it to Rita Mae Brown. It just doesn’t seem like an Einstein kind of topic, does it? Freud or Jung maybe – but Einstein? That quote is attributed to Einstein. But if you buy into its logic, wouldn’t it be insane to expect better results by electing another political neophyte with no public sector experience, who parrots well worn (and often disproven) conservative principles, proposes simplistic solutions and more tax cuts to balance the budget? Yes, it would be insane. 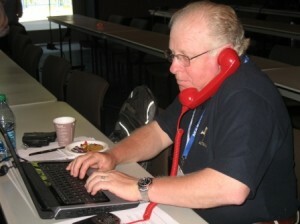 Jerry needs to have a better response to his relationship with the unions. He can’t and shouldn’t hide the relationship, but needs to emphasize that he can, has, and will continue think and act independently based on what’s best for the people of California. He could also use his age to assert his independence: at 74 he doesn’t have a long political future ahead of him and wouldn’t be thinking as much about how he would be financing his next campaign. Another thing is that unions are being unfairly demonized. eMeg cites $300 million in political contributions over the last 5 years. What is the figure for corporate political contributions and lobbying? I don’t know, but it probably dwarfs what organized labor spends. Here’s the question- after watching the debate for one hour who would you want over for dinner? Jerry and you would invite him back. Whitman was boring and you knew she was not ready for prime time when the first question to her was how would you get the budget passed earlier. Whitman responded like she was asked to repeat her commercial. The reporter had to ask her again the same question. well, well, well if it isn’t Baghdad Bob Mulholland, you are right back to your dirty games of digging up trash on people, such as Meg Whitman and the illegal alien maid, this story stinks of you! I wouldn’t mind having Nicky Diaz over for dinner tonight. Now THAT would be interesting. If Nicky’s not available, then yes, Bob, definitely Jerry.